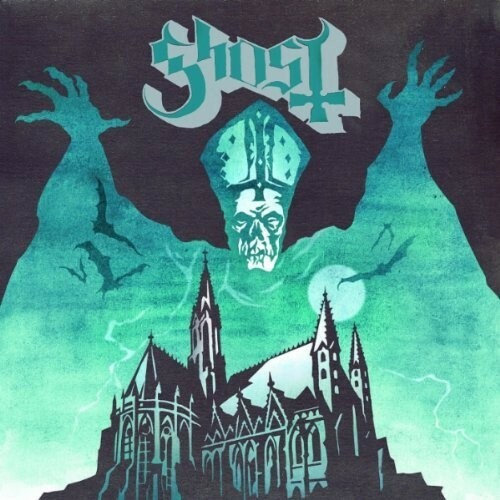 There are a number of bands doing the rounds under the title of Ghost, but none like the version from Stockholm . The band themselves are nameless and dressed in skull face paint and hoods, and they offer a macabre mixture of gothic black metal with commercial overtones. Beginning in fine fashion with a haunting church organ piece called 'Deus Culpa' its quite clear the band have decided on a mood to their personas that takes us back to the dark ages . 'Con Clavi Con Dio' begins in galloping fashion and brought to mind Mercyful Fate but with more melodic vocals. The song has a haunting guitar riff as it builds in structure and stretches out to the beyond. A personal favourite, 'The Ritual' has a chorus that echoes the most esoteric moments from Blue Oyster Cult's 70's period, yet the song is an enigma in that the verses have a dark feel closer to Witchfynde or Angelwitch! One of the joys of music is discovering new and exciting artists and you get that feeling with Ghost, kind of like that feeling of finding a forgotten gem from the New Wave of British Heavy Metal. The current single 'Elizabeth' could easily have been a track from Blue Oyster Cult's 'Spectres' release, yes its that good! The riffs could have been on any Diamond Head record but the chorus has commercial value that could well help this band rise above the competition. One of the criticisms levelled at the Black Metal genre is the lack of originality or the poor vocals, well Ghost intend to change all that. It's clear the band have an ear for a great hook but never at the cost of drifting off into parody, and this serves a song like 'Death Knell' well. The commanding vocals bring to mind old churches and graveyards at dawn and the interesting time changes show the band has many strings to their bow. Metallica could have a field day with a song like 'Prime Mover', with its foot stomping guitar work that leaves mammoth footprints on this release. Bringing things to a close a keyboard introduces instrumental 'Genesis', a song that has certain progressive elements as the guitars compete with the keyboard work. There is a nice end section of acoustic guitar work which brings the song to a beautiful close. I will go out on a wing here and say Ghost are going to be big, and this could be one of the biggest bands on the Rise Above Records roster.